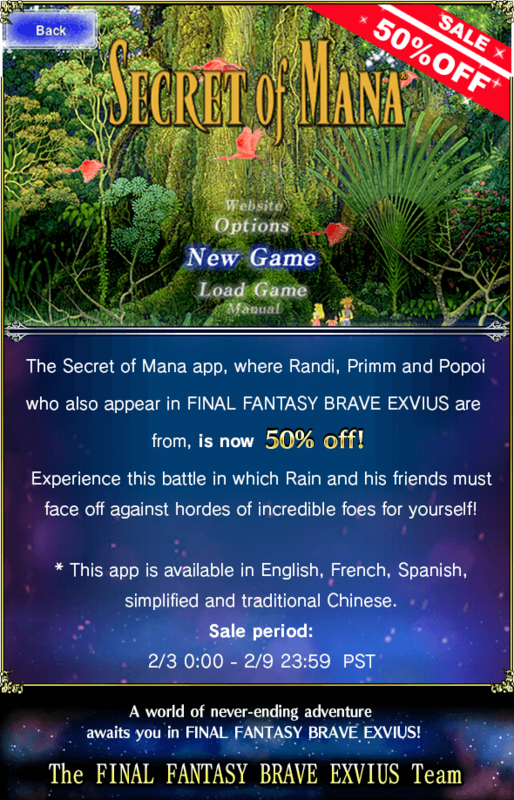 FINAL FANTASY Portal App event! 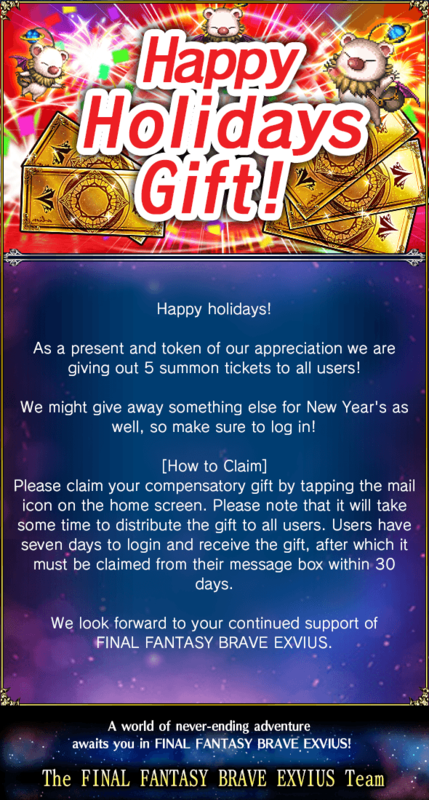 Chances to get 5★ Select Summon Tickets this month! FINAL FANTASY BRAVE EXVIUS ORIGINAL SOUNDTRACK VOL.2 is now on sale! STAR OCEAN -anamnesis- Vanquish Jie Revorse! Fan Festa 2018 – Streaming Announcement! Fan Festa 2018 – In-Game Rewards Round Up and More! FFBE FAN FESTA 2018 Celebration! Fan Festa 2018 – Goodie Bag Reveal and Developer Panel Details! 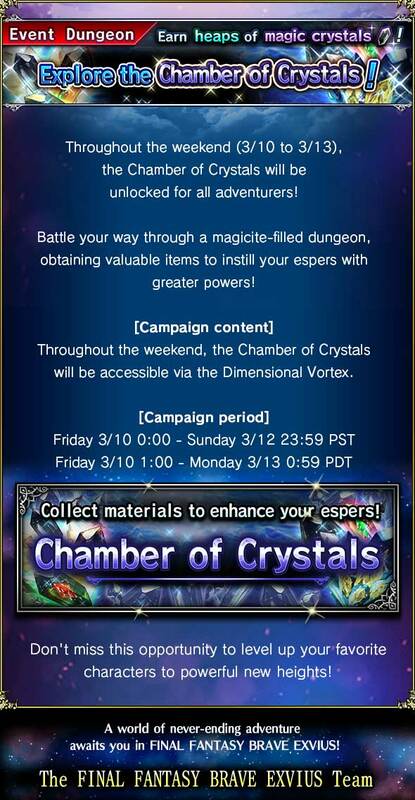 Chamber of Awakening - Drop Rate Increased! Introducing the Halloween 2018 summon! Scorn of the Beasts - Updated! Fan Festa 2018 – MC and Goodie Bag Reveal! FFBE Fan Festa 2018 - In-Game Rewards and Exciting Developer Panels Await You! FFBE Fan Festa 2018 - Tickets On Sale Now! FFBE Fan Festa 2018 – Ticket Sales Begin 8/3/18! STEP UP SUMMON - CLOUD SPECIAL! Chamber of Arms A new foe awaits! Updated - 3★ Espers Unlocked! Updated - Wave battles incoming!? Updated - 30 Million Download Celebration! 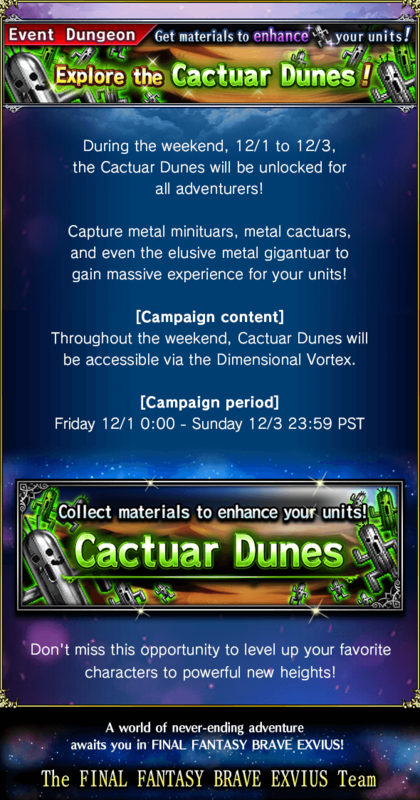 Updated - FINAL FANTASY PORTAL APP event! New 'Let's Play FFBE' livestream! 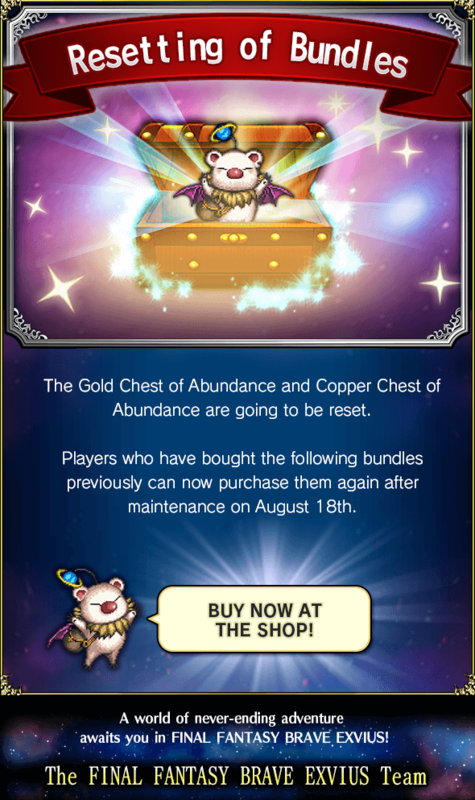 The limited bundles are going to be reset! 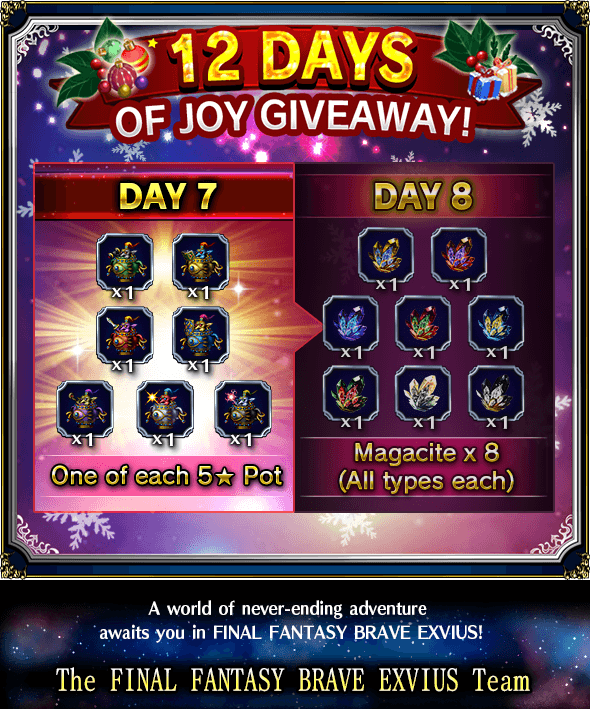 12 DAYS OF JOY GIVEAWAY! 3x Rainbow Summon Rate Increase!!! New 'Let's Play FFBE' video out now! Rank and unit cap raise! 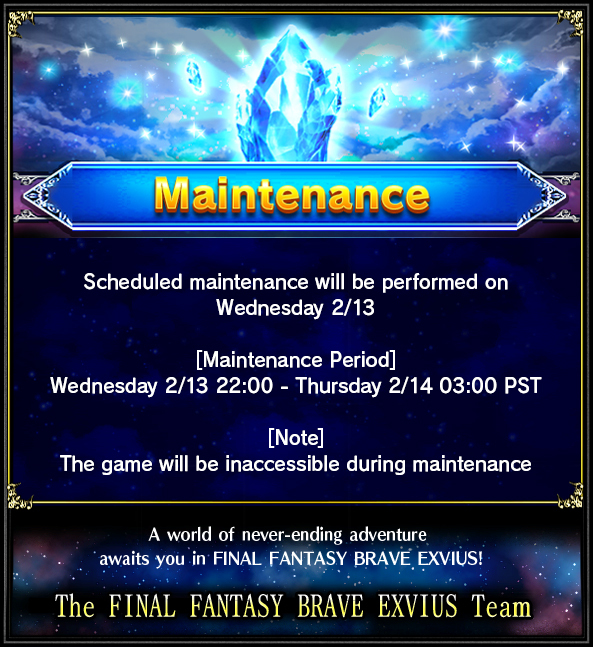 New FFBE Updates video out now! New 'Let's Play FFBE' streaming schedule! Daily Quest Rare Summon Ticket Reward! 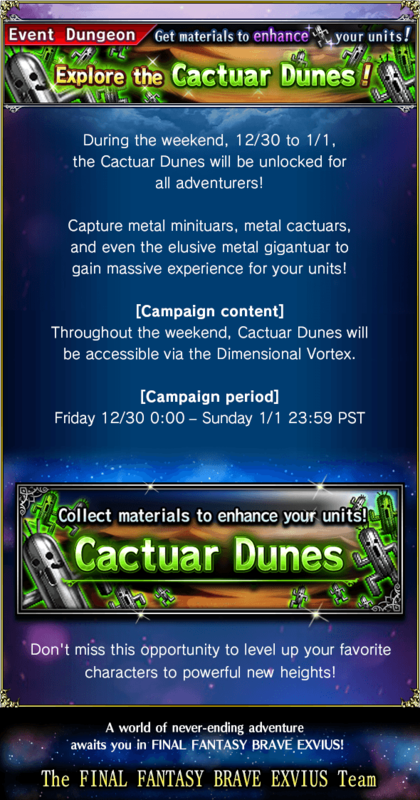 Community Event: YoRHa arrives in Lapis! Introducing the 10+1 Summon Ticket! 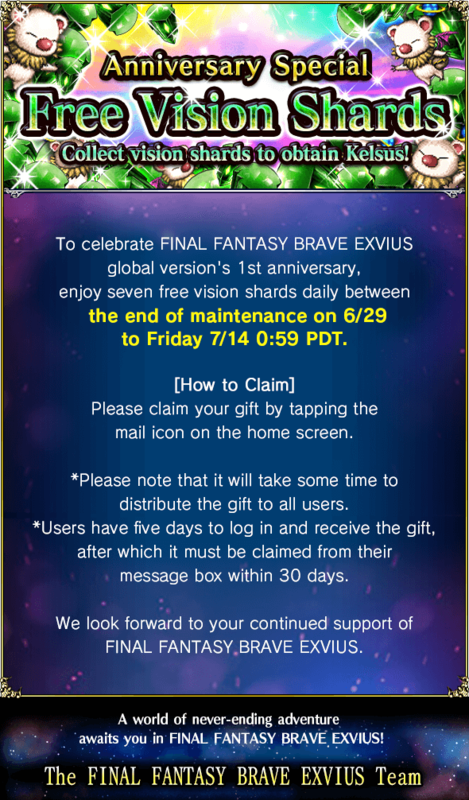 1st ANNIVERSARY CELEBRATION! At least 1 guaranteed 5★ unit! 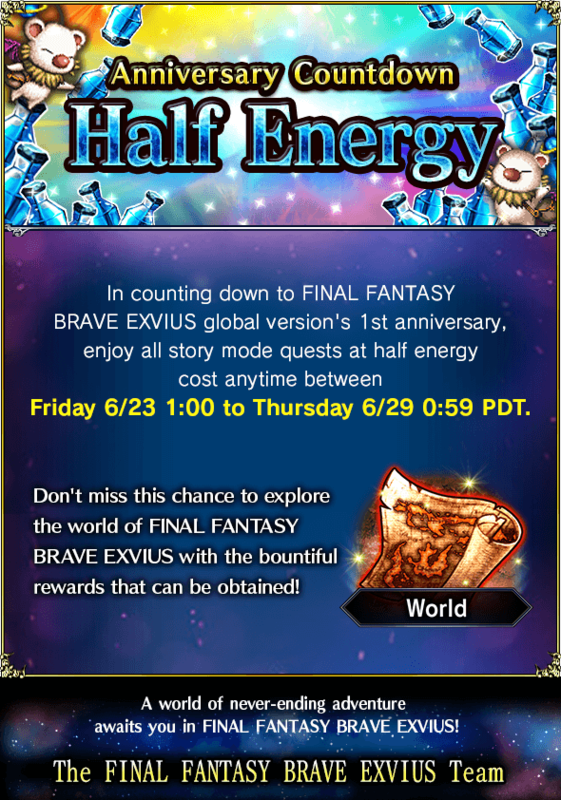 Greetings FINAL FANTASY BRAVE EXVIUS fans! 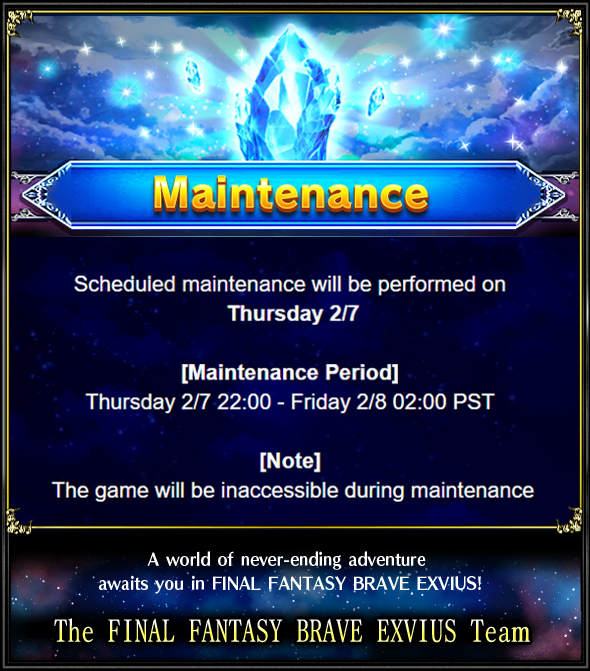 [2017-05-11] New FFBE updates video out now! 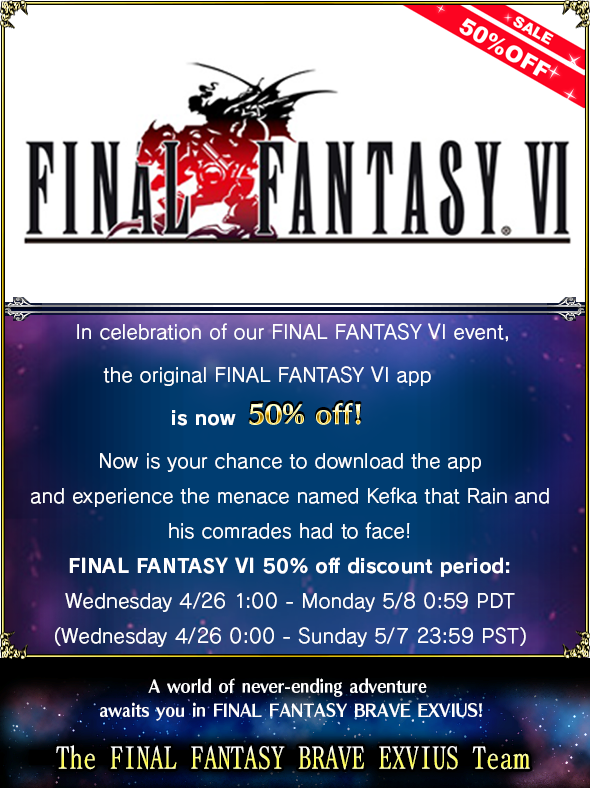 [2017-04-26] The original FINAL FANTASY VI app is now 50% off! [2017-04-19] FINAL FANTASY Portal App event! [2017-04-11] FINAL FANTASY Portal App event! [2017-03-24] 30 Days Free Lapis Give Away! [2017-03-16] Thank you for playing FINAL FANTASY BRAVE EXVIUS. 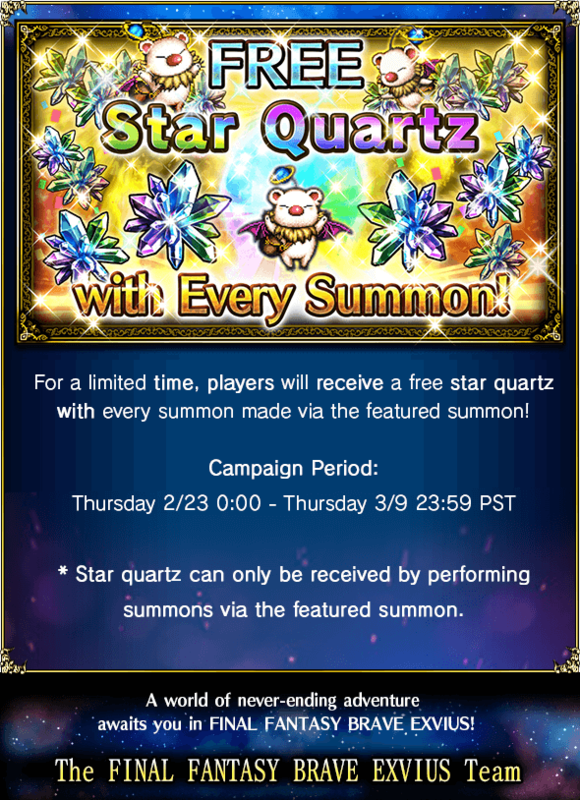 [2017-02-22] Free Star Quartz with Every Summon! [2017-01-24] Celebrating the Lunar New Year! 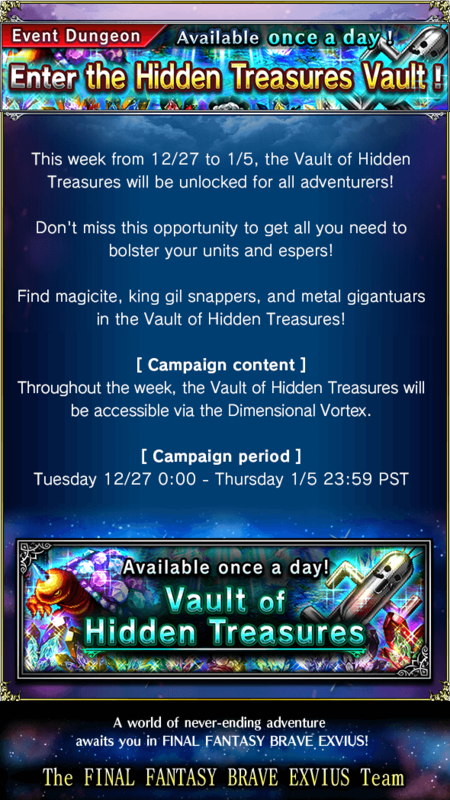 [2017-01-17] FINAL FANTASY Portal App event! Lightning, Hope and Fang are on their way starting December 9th. A new Trial has appeared! 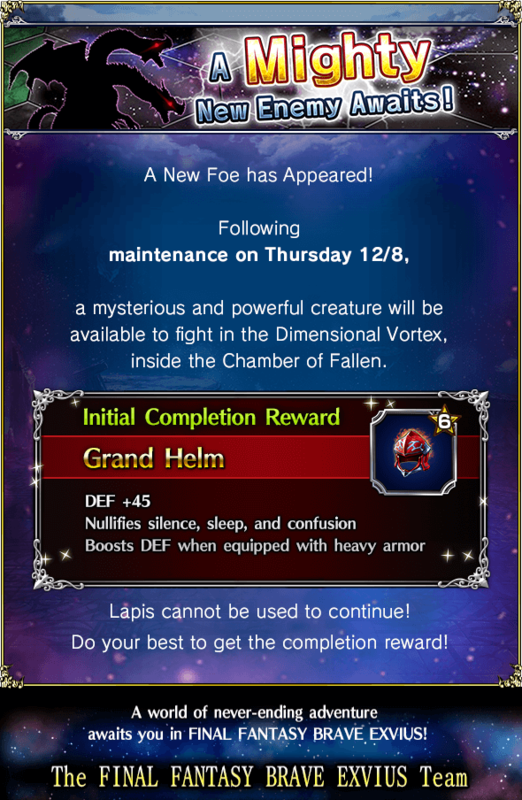 Following maintenance on Thursday 12/8, 2-Headed Dragon will be available to fight in the Dimensional Vortex, inside the Chamber of Fallen. Grand Helm as the first time completion reward. For more info, check out the trial page. 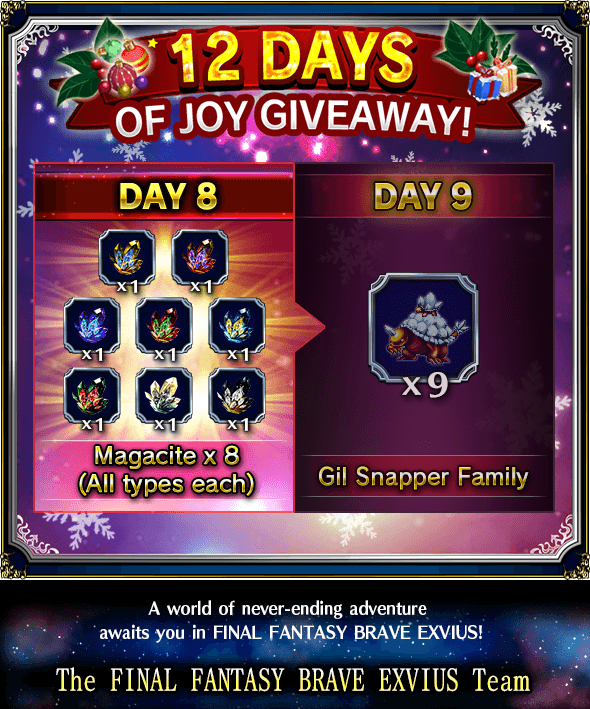 New units Snow, Vanille and Sazh are on their way starting December 2nd. Level up and receive gifts depending on your achieved rank. Players must take a screenshot of their Player Info window and post it on the designated Facebook event page. Note: Players will receive the rewards based on the highest achieved tier within the event period. For more information regarding this event, please visit the official Facebook event page. 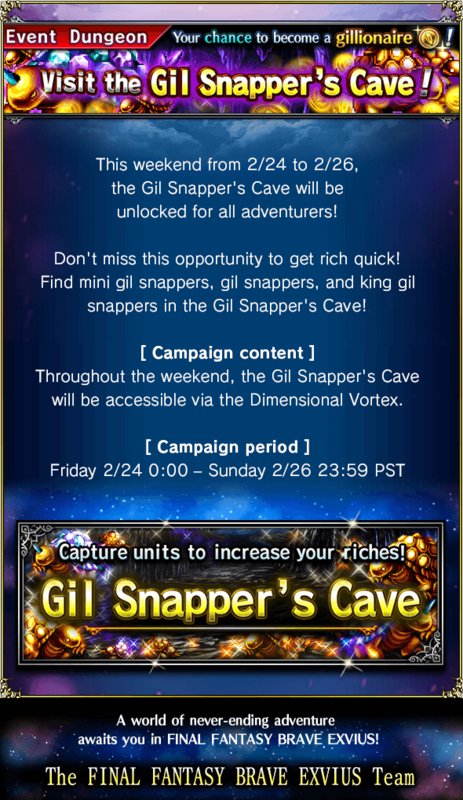 New units Gilgamesh, Faris are on their way! Drop rates for Bartz, Exdeath also increased starting November 25th. You can now awaken Exdeath, Bartz to 6-star and Krile, Galuf to 5-star ! The second part of Olderion Federation will be available to explore after maintenance concludes on Thursday 11/24. Check out maps and guides on Olderion Federation page. Starting from Thursday 10/27, Antenolla will be available to fight in the Dimensional Vortex, inside the Chamber of Fallen. Thorned Mace as the first time completion reward. Dark Knight Cecil, Cloud of Darkness, Gaffgarion, Garland, and Duane are on their way! Drop rates increased starting November 18th. Reach milestones in Brave Frontier and get rewarded in FINAL FANTASY BRAVE EXVIUS. 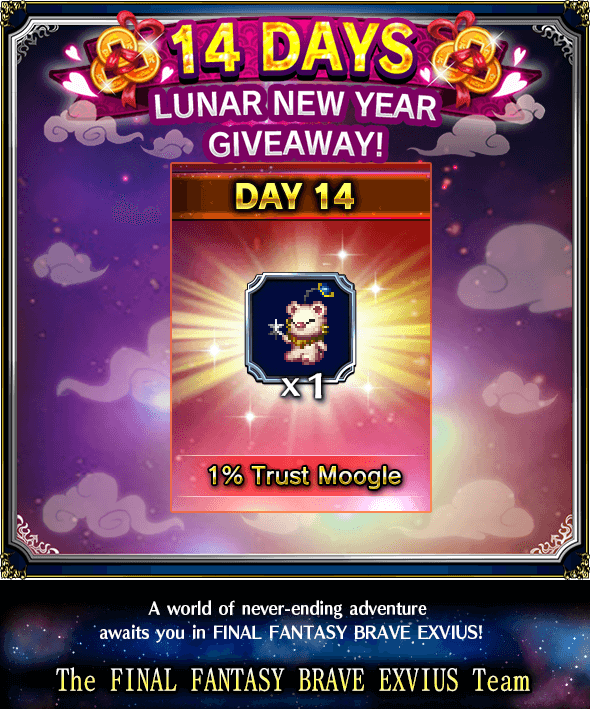 Reach milestones in FINAL FANTASY BRAVE EXVIUS and get rewarded in Brave Frontier. Reach the final milestones in both games to get the extra unison reward. See the official collaboration site for more detail. New units Elza, Tilith, Seria, and Karl are on their way! Drop rates increased starting November 11th. Elza is a global exclusive unit. 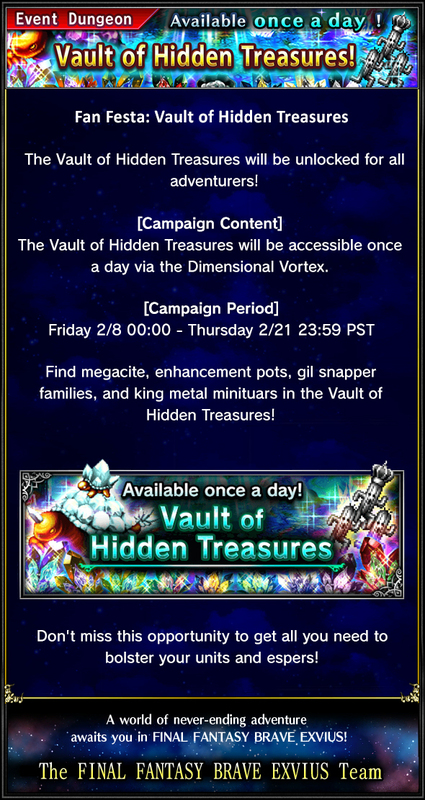 They all are limited time only, and will no longer be available to summon after it's over. Take your favorite party to war against your rivals and fight for great prizes! You can access Arena from the menu previously called Colosseum. Colosseum is still be accessible inside the Arena. The amount of orbs has been increased to five. Various enhancer units for each stats (HP/MP/ATK/DEF/MAG/SPR) are also introduced. You can fuse them to a unit to increase their stats, up to a cap which are different for each unit and rarity. Check their individual unit page to see their cap. For more info, check the Arena page. Missions will be added to all quest on the world map and in the dimensional vortex! Clear quests and fulfill various conditions to get rewards! 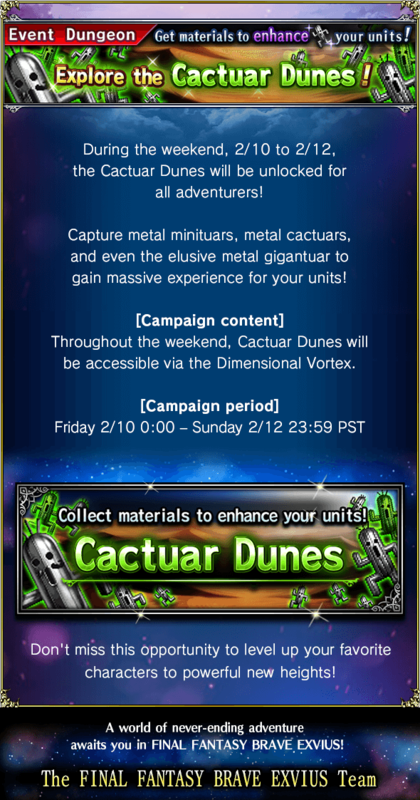 Check dungeons or vortex page to see the list of new missions to achieve and gain rewards, mostly Lapis! You can now awaken Cloud of Darkness to 6-star ! The 6-star awakening materials can be obtained from the frequent King Mog exchange event and more event/dungeon in the future. Note that these rewards are not in addition to the daily rewards, it replaces them instead. For the next five days starting from Monday 10/31, you'll be given out 1,000 friend points per day! 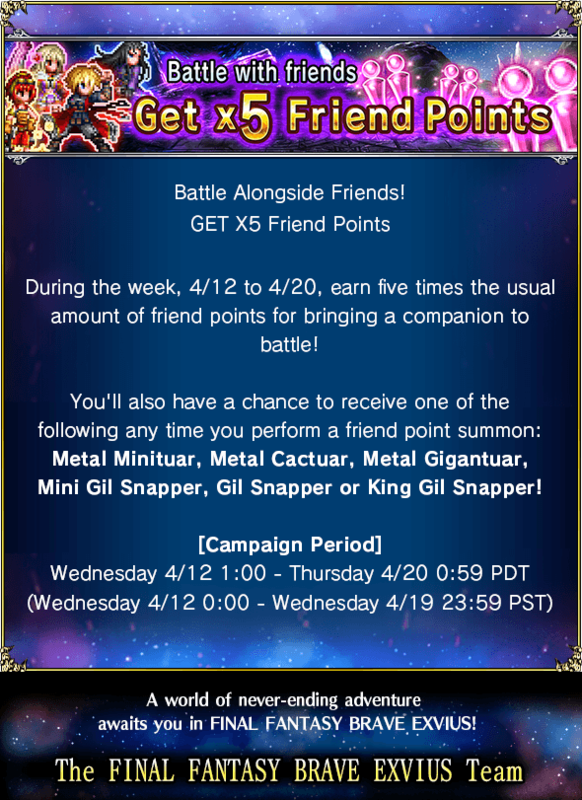 You'll also have a chance to receive one of the following any time you perform a friend point summon: Mini Metal Cactuars, Metal Cactuars, Jumbo Metal Cactuars, Mini Gil Snappers, Gil Snappers, and King Gil Snappers! A new area will be available for exploration starting Thursday 10/27 7:00 PDT. The water-locked Olderion Federation. Rain and his crew must venture to this aquapolis to save the Water Crystal. From the world map screen tap Industrial City Dilmagia to unlock Olderion Federation. Starting from Thursday 10/27, Greater Demon will be available to fight in the Dimensional Vortex, inside the Chamber of Fallen. Wizard Rod as the first time completion reward. New units Demon Rain, Dracu Lasswell, White Witch Fina, and Black Cat Lid are in their Halloween costumes for a party! Drop rates increased starting October 21st. These Halloween units are our first global exclusive units. They are also time-limited, and will no longer be available to summon after it's over. New units Dark Knight Cecil, Rosa, Edge are on their way! Drop rates for Cecil also increased! Drop rates increased starting October 14th. You can now awaken Cecil to 6-star and Rydia and Kain to 5-star ! The 6-star awakening materials can be obtained from the frequent King Mog exchange event and more dungeon in the future. Obtain new awakening materials in the new Chamber of Awakening - PRO dungeon. These materials are used for newer 5-star units like Rydia and Kain. Take note that no 6-star awakening materials can drop from this dungeon. FINAL FANTASY TACTICS 2nd Wave! New units Ramza, Agrias and Mustadio are on their way! Drop rates increased starting October 7th. New allies join the fray! New units Delita, Gaffgarion and Alma are on their way! Drop rates increased starting September 30th. Brace yourself and enter the Colosseum for a brand new rank where rare items await those who accept challenge! Advanced difficulty rank (ADV) has been added. Players can only challenge the new rank after completing Intermediate (INT) rank of the colosseum. See the news image for a list of rare and featured items you can obtain from the new ADV rank. Prepare for 6★! 100 lapis daily! Prepare to summon new and stronger allies to assist you in FINAL FANTASY BRAVE EXVIUS. 6-star units will become available from 9/30! Players will receive 100 lapis daily for 37 days, up to 3,700 total. New units Lightning, Ludmille and Charlotte are on their way! Drop rates increased starting September 23rd. A new area will be available for exploration after maintenance concludes on September 23. The Story Continues! The Dirnado saga's final chapter! Lid, Rain and the gang must make their way to the Wind Shrine. It is said a powerful esper knows as Diabolos resides on this new island. Starting from Friday 9/23 in the Farplane... A Mighty New Enemy Awaits! Gain powerful new equipment, Killer Bow, upon defeating this fearsome beast. Drop rates for Chizuru, Cloud of Darkness, Warrior of Light, Kefka, and Lenna increased starting September 16! These are the units that are voted on Facebook from previous campaign. Featured Summon Fencer, Thief and Juggler will be available for a limited time starting Sept 9 with increased drop rates! Draw single and get 200 Mogcakes as an additional bonus, or draw 11 for a guaranteed 4-star or higher unit and get 2000 Mogcakes and 1 Rare Summon Ticket free. For the next few weeks, you'll have a chance to earn in-game rewards if you connect your account to Facebook. 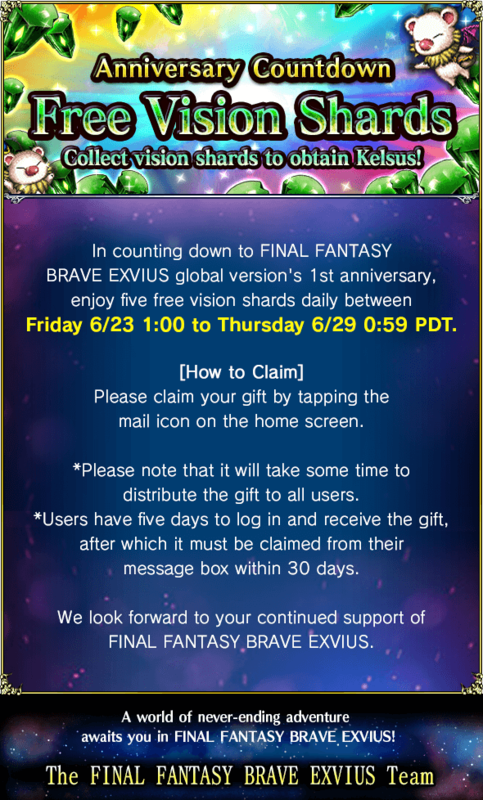 All fans who have connected their FFBE accounts to their official Facebook account and have liked the official Facebook page will be eligible to obtain the reward. Players must have connected to their Facebook account before September 16, 0:59 PDT. To do so, they need to go to Menu > Option > Facebook. Plus additional Metal Gigantuars (currently +7) by sharing the official Facebook Connect and Collect announcement on Facebook. See the event page here. Drop rates for Leo, Terra, Celes, and Locke increased starting September 2nd. These are previously released units, to see their ranking check Unit Rankings. 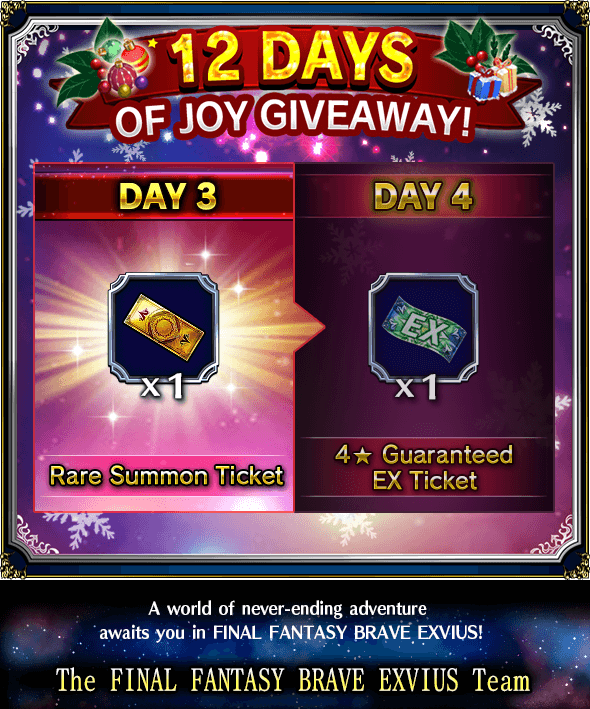 On top of that, players will also receive five rare summon tickets! New units Garnet and Freya are on their way! Drop rates for Amarant, Lani, Kuja, Zidane, and Vivi also increased starting August 26th. All chambers will be open for a week starting Friday, 8/26! Lacking materials, evolution items, experience, or gil? You're bound to find whatever your looking for! Throughout the week, all Vortex of Desire Chambers will be unlocked for your adventuring delight! Vote for your Favorite Unit! You can vote for your favorite hero or heroine unit to be featured in the future Summon Special event (where their rates will be higher than usual). All you have to do is "Like" the image of your favorite unit(s) image of your favorite unit(s) in the following groups: A, B, C, D, E.
A New Foe has appeared! A mysterious and powerful creature, Intangir, will be available to fight in the Vortex of Trials, inside the Chamber of Fallen. Gain a powerful new equipment upon defeating this fearsome beast. 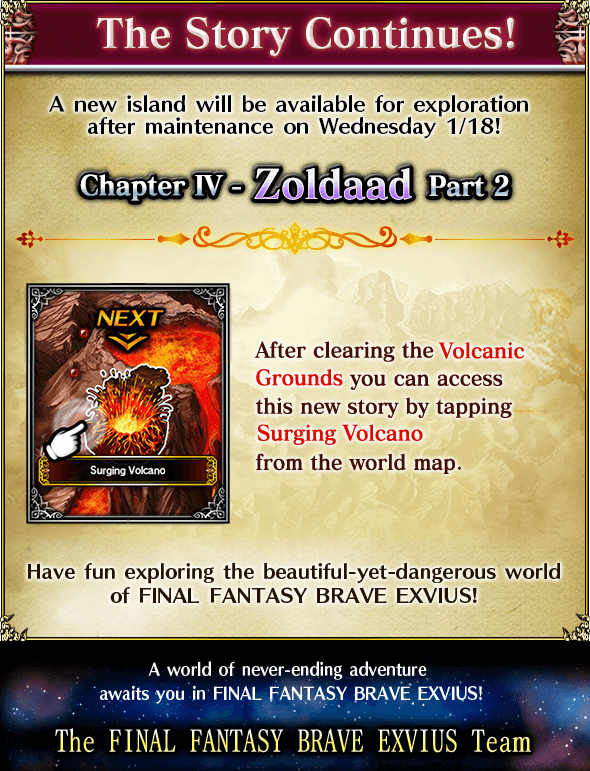 A new island will be available for exploration after maintenance concludes on 8/25. It's time for Rain and Lasswell to venture to Dirnado where majestic airships soar through the vast and open skies. Dirnado can be unlocked by clearing Shrine of Decay then proceeding to Ghost Port Kolobos. New units Amarant and Lani are on their way! 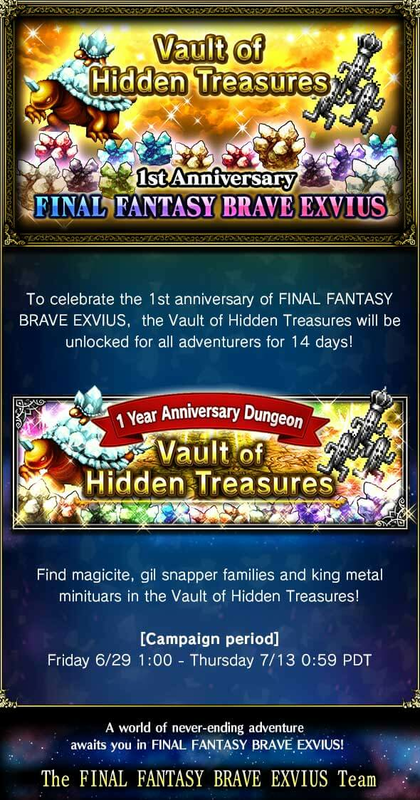 Drop rates for Kuja, Zidane, and Vivi also increased starting August 19th. End: August 27th, 2016 (Friday) 00:59:59 PDT. Success Rate Boosts for a Limited Time Only! 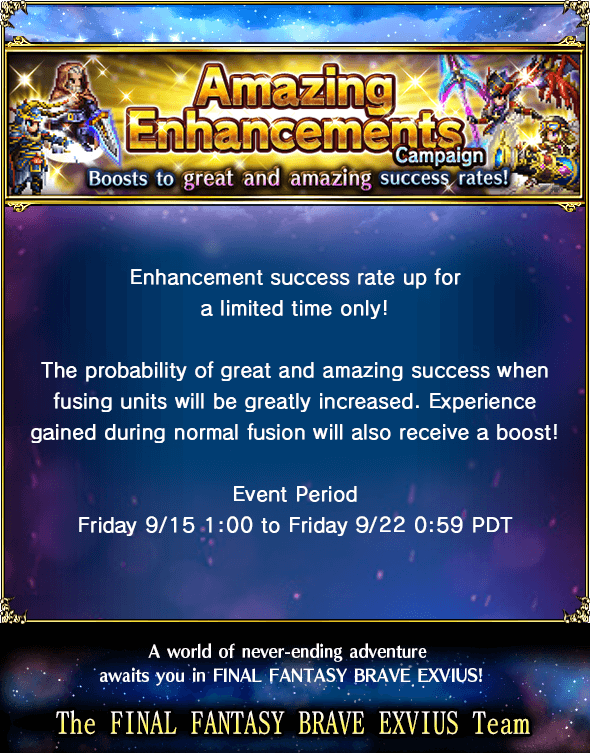 For three days starting Monday 8/15, you can enjoy a period of enhanced fusion success rates! During this time, the probability of great and ultra success when fusing units will be greatly increased. Experience gained during normal fusion will also receive a boost! Start: August 15th, 2016 (Monday) 01:00:00 PDT. End: August 18th, 2016 (Thursday) 00:59:59 PDT. From August 11th to 19th, you can get a rare summon ticket, a magic key, an elixir, a phoenix down and five megacites which vary in color by day for the low cost of just 300 with a purchase limit of one summer package per day. Start: August 11th, 2016 (Thursday) 01:00:00 PDT. End: August 20th, 2016 (Saturday) 00:59:59 PDT. In Celebration of the Final Fantasy Brave Exvius Facebook page receiving 100,000 likes, players will receive 30 energy and 100 lapis daily through the dates listed below. Start: August 12th, 2016 (Friday) 01:00:00 PDT. End: September 2st, 2016 (Thursday) 00:59:59 PDT. For 3 days starting from Friday 8/12, earn five times the usual amount of friend points for bringing a companion to battle! End: August 15 19th, 2016 (Thursday) 00:59:59 PDT. Rewards can be received from the inbox within the following period. Start: August 8th, 2016 (Monday) 01:00:00 PDT. End: September 1st, 2016 (Thursday) 00:59:59 PDT. Warrior of Light, Lenna, and Tellah are on their way! Summon them to fight alongside you starting August 5th! 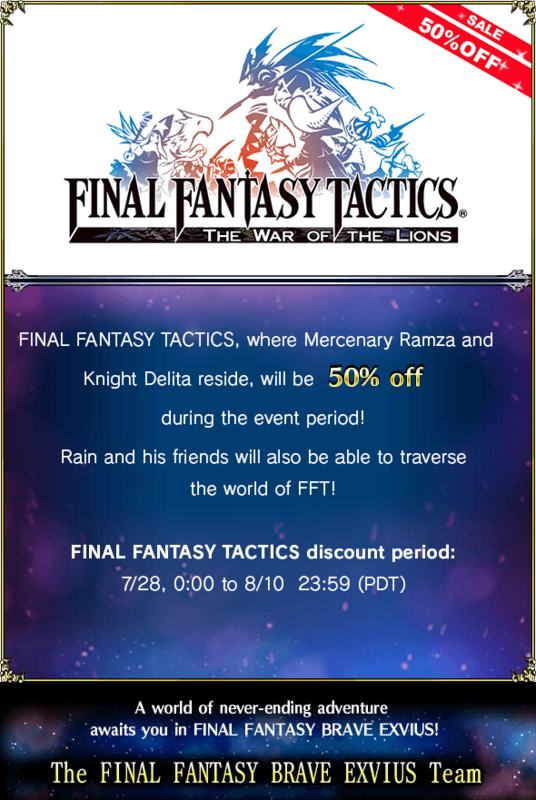 Major boost to drop rates from Friday 8/5 01:00 to 8/20 00:59 PDT (8/5 00:00 to 8/19 23:59 PST). End: August 20th, 2016 (Friday) 00:59:59 PDT. Start: July 26th, 2016 (Tuesday) 01:00:00 PDT. End: July 31st, 2016 (Sunday) 00:59:59 PDT. A new island will be available for exploration after maintenance concludes on 7/28. It's time for Rain and Lasswell to venture to Kolobos, where it is said the fabled esper Ramuh resides. Maps and guides will be updated before the release, look out for them in towns, dungeons, and explorations. Names and details might differ slightly from the global version, they will be double-checked as soon as possible. Start: July 28th, 2016 (Thursday). All chambers will be open for a week starting Monday, 7/25! 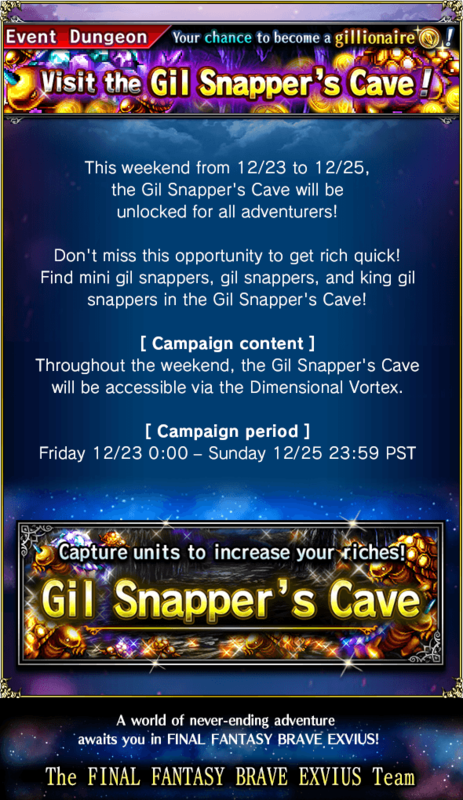 Lacking materials, evolution items, experience, or gil? You're bound to find whatever your looking for! Start: July 25th, 2016 (Monday) 01:00:00 PDT. End: July 30th, 2016 (Saturday) 00:59:59 PDT. Hayate, Locke, and Artemios are on their way! Summon them to fight alongside you starting July 22nd! Major boost to drop rates from Friday 7/22 01:00 to 8/5 00:59 PDT (Friday 7/22 00:00 to 8/4 23:59 PST). End: August 5th, 2016 (Friday) 00:59:59 PDT. 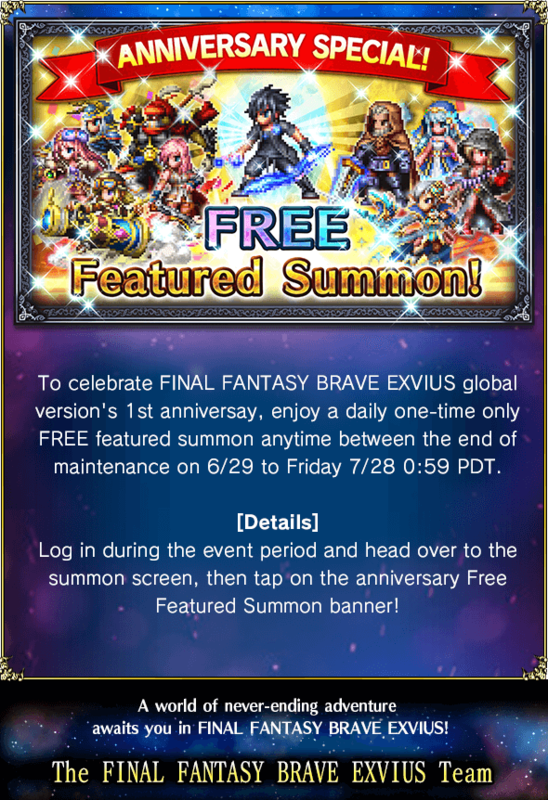 As a welcome gift for all our newest heroes, we will be awarding five rare summon tickets to all players who start playing FINAL FANTASY BRAVE EXVIUS joining us after 07/18/2016. 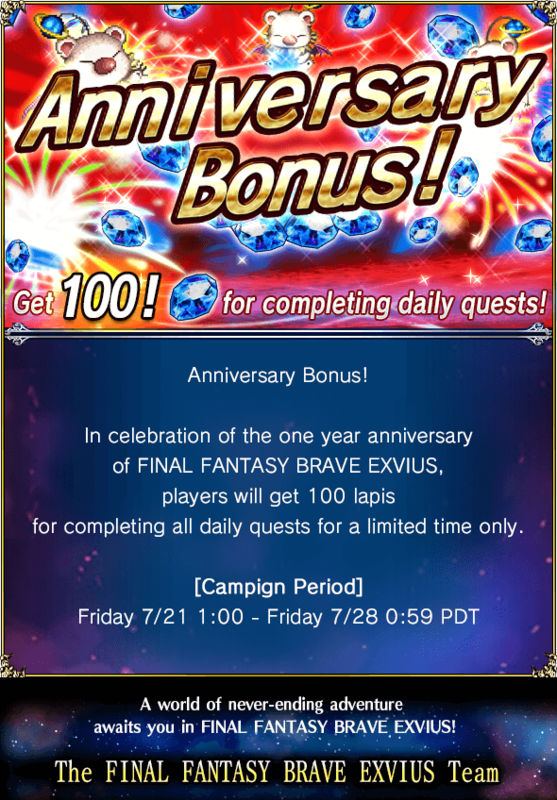 A first time completion reward of 1 Rare Summon Ticket and 100 Lapis will be awarded for each of the above missions. Start: July 18th, 2016 (Monday) 01:00:00 PDT. For the next five days starting from Monday 7/18, we'll be giving out 1,000 friend points per day! Check your inbox every day to obtain 1,000 friend points. Be sure to claim them before they disappear at the end of the day! End: July 23rd, 2016 (Saturday) 00:59:59 PDT. Starting from July 14th at 01:00 PDT (7/14 00:00 PST), a mysterious and powerful creature will available to fight in the Farplane. Gain powerful new equipment upon defeating this fearsome beast. This new opponent will be available to battle upon defeating the White Dragon. Start: July 14th, 2016 (Thursday) 01:00:00 PDT. Kefka, Golbez & Chizuru are on their way! Summon them to fight alongside you starting July 8th! Kefka: Cruel and mad, Kefka is a mighty mage who instills fear in friends and foes alike. Golbez: A powerful villainous spellcaster who once commanded the four archfiends. Chizuru: A samurai who valued loyalty and decorum, and wielded her blade only in service to her master. Success Rate Boosts for a Limited Time Only! For two weeks starting Monday 7/4, enjoy a period of enhanced fusion success rates! Start: July 4th, 2016 (Monday) 00:00:00 PST. End: July 17th, 2016 (Sunday) 23:59:59 PST. For the next 2 weeks starting from Monday 7/4, earn five times the usual amount of friend points for bringing a companion to battle! Welcome to wonderful world of FINAL FANTASY BRAVE EXVIUS. 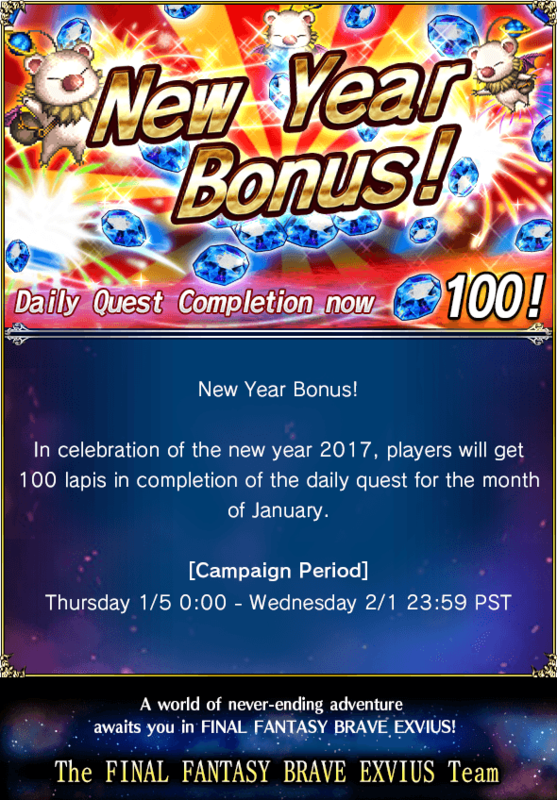 As a special welcoming gift, we will be handing out 100 lapis per day every day for 10 days. You will be able to join forces with legendary heroes from past FINAL FANTASY adventures, as well as new warriors unique to the realm of Lapis. Venture across a new and exciting land as you vanquish hordes of monstrous beasts and undertake numerous heroic quests. You will have at your disposal a wide range of magic, skills, and even the powers of mighty espers! Remember to log in daily to claim your special gift of 100 lapis which can be obtained from your inbox. These rewards will disappear at the end of each day, so be sure to claim them while you can! Start: June 30th, 2016 (Thursday) 06:00:00 PST. End: July 10th, 2016 (Sunday) 05:59:59 PST. You can claim your rewards from the message box after you've completed the tutorial! We greatly appreciate all your support as we begin this exciting new venture! We hope that your future experiences in this all-new chapter of the long-spanning FINAL FANTASY saga will be a memorable ones. Just remember: to quality for the Crystal Milestone Campaign rewards, you must download and play the game on or before July 17th, 23:59:59 PDT (22:59:59 PST). Users who start the game on July 18th PDT and onwards will not receive the rewards. End: July 17th, 2016 (Sunday) 23:59:59 PDT. 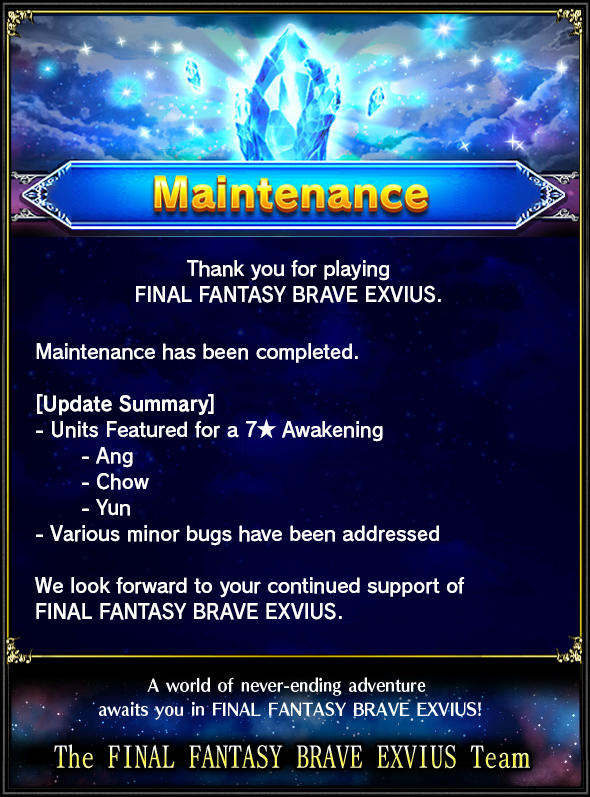 Thank you for participating in the FINAL FANTASY BRAVE EXVIUS experience! As our way of thanking you for your participation, starting from 6/27 (Monday), we'll be sending you a special gift of 100 lapis each day, directly to your inbox. We hope that you're enjoying your adventures in the world of FINAL FANTASY BRAVE EXVIUS, and we appreciate your continued support as we go global in the coming days! 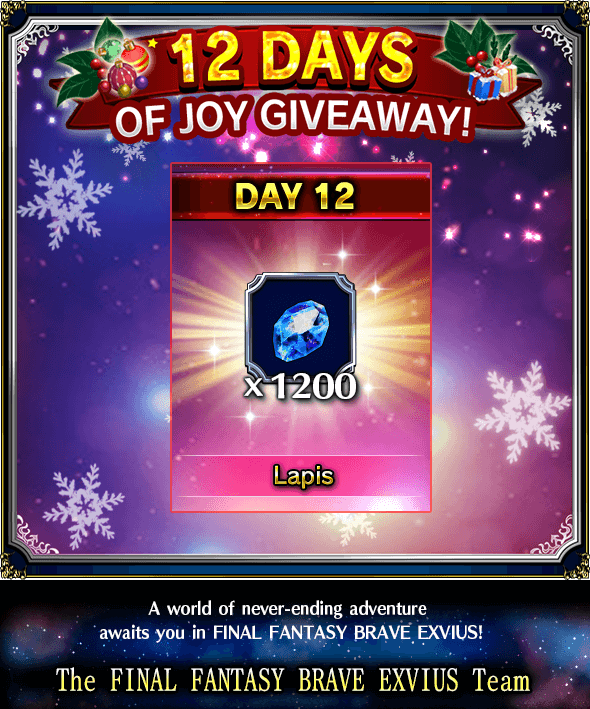 Remember to log in daily to obtain your special gift of 100 lapis from your inbox. These rewards will disappear at the end of each day, so be sure to claim them while you can! Start: June 27th, 2016 (Monday) 07:00:00 PST. End: June 29th, 2016 (Wednesday) 23:59:59 PST. Fusion Boost for a Limited Time Only! For five days starting 6/20 (Monday), enjoy a period of unprecedented fusion success rates! Start: June 20th, 2016 (Monday) 07:00:00 PST. A content update, including a new island, Lanzelt, will be available after maintenance, starting Wednesday June 15th, from 00:00 AM to 07:00 AM PST. It's time for Rain and Lasswell to venture to Lanzelt, where it is said the fabled espers Shiva and Golem reside. The land of Lanzelt will be added. The espers Shiva and Golem will be added. Daily login rewards/daily quest will now reset at 00:00 PST. Various minor issues will be addressed. Start: June 15th, 2016 (Wednesday) 07:00:00 PST. Looking for powerful new heroes to join your party? Gilbert & Celes available to be summoned from June 9th onwards! Join forces with Gilbert the bard, whose songs and skill with the lute are known far and wide! Overpower your foes with General Celes, a mighty Magitek Knight whose countless triumphs in battle are the stuff of legend! Start: June 9th, 2016 (Thursday) 00:00:00 PST. For the next five days starting from Monday 6/6, earn five times the usual amount of friend points for bringing a companion to battle! Start: June 6th, 2016 (Monday) 00:00:00 PST. End: June 10th, 2016 (Friday) 23:59:59 PST. Prepare for Xiao and General Leo's arrival! Get them from the Summon area starting May 26th. Start: May 26th, 2016 (Thursday) 00:00:00 PST. For the next five days starting from Monday 5/23, we'll be giving out 1,000 friend points per day! Check your mail every day to obtain 1,000 friend points. Be sure to claim them before they disappear at the end of the day! Start: May 23rd, 2016 (Monday) 00:00:00 PST. End: May 27th, 2016 (Friday) 23:59:59 PST. Enter the Vortex of Desires! All chambers open this weekend! Lacking materials, evolution item, experience, or gil? This weekend, you're bound to find whatever you're looking for! Throughout the weekend, all Vortex of Desire chambers will be unlocked for your adventuring delight! Start: May 20th, 2016 (Friday) 00:00:00 PST. End: May 22nd, 2016 (Sunday) 23:59:59 PST. Announcing FINAL FANTASY BRAVE EXVIUS, an all-new RPG in the classic FINAL FANTASY tradition. Pre-register today to receive powerful items to use on your adventure! Race ahead by contributing more crystal points to unlock better and more rewards! A loyal chocobo will accompany you as the journey progresses with the recruitment of each aspiring knight. As more allies join the cause, more and more rewards will be unlocked! This page was last edited on 24 April 2019, at 11:39.